The other day I saw a picture of Seneca ( then Champagne) and I was amazed that I am on the same boat. She was set up for weekend cruises on the Bay and was so empty and … clean. Now after living aboard half the year for three years she is different. I will try and add a bunch of pics of the major and minor changes. Now I will just go through the last big one. I often find myself sitting on my boat staring at something that has bothered me for awhile. Running through my head are a myriad of ideas and thoughts on how I can make it better for my purposes. With my great friend shawn and his wife Suzanne coming soon I was motivated to tackle a project that has been brewing for a long time. Seneca was designed with two berths in the main cabin. I reduced one to a coffin when I put in mark counter space for the galley. So I wanted to take that unused cushion and expand the remaining bed into a large ‘ murphy bed’. Using scraps from work I was able to do this for no cost. I basically have a couple pieces of plywood that sit in ledgers and clip in. When not in use it folds in half and easily stores away. The bed seems huge! It works great. The only problem is that it gets hot with no hatch in that part of the boat. So after looking into buying a hatch I decided tomake one and then just cut a big hole in my boat. 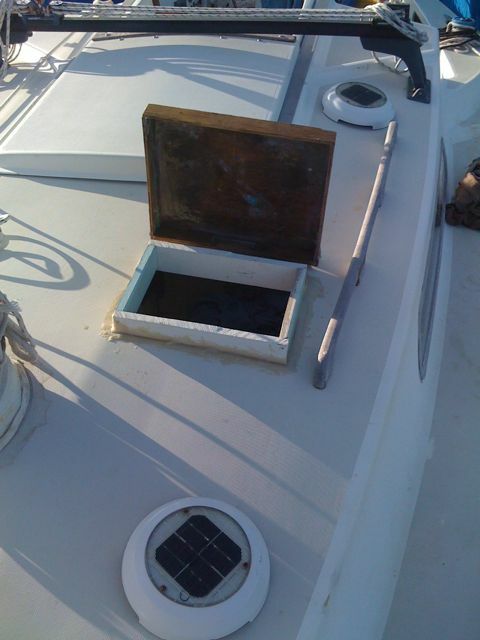 I sailed out to a nice anchrage and sawed and glued and built a hatch. Again using scraps I found only this time I bought the hinges for a few bucks. Now visiting couples have a big cool bed. I actually use it instead of the v-berth now. The hatch is fully functional. Now I need only sand and paint it. I am including some pics so you get the idea. Wow. That looks really cool. 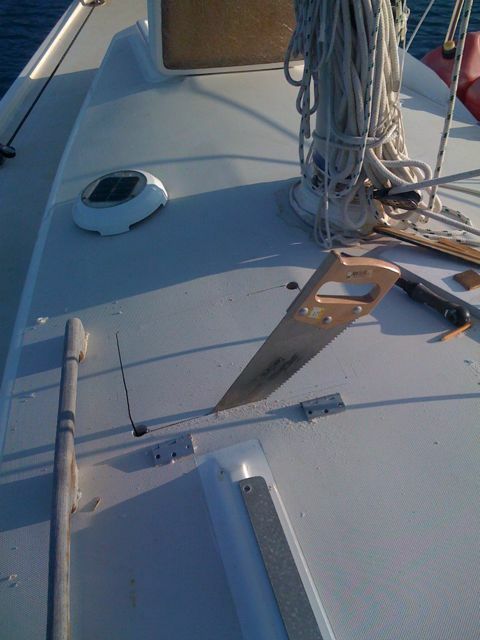 I love shot of the saw sticking out of the boat. And to think you finished the project – how “unVanDyke” – the old man would have tarped the hole for a few months til he got around to finishing it – lol. It is a whole new way of thinking….almost Valinoti-like…..We miss you – and love you…did you get Flat Stanley yet? Perfect for us to visit!! Miss you! That looks great! Nice work. I think your next trip to k-mart should be for some niceish looking small plastic storage bins just to tuck away all the little odds and ends – that would make it very spiffy. 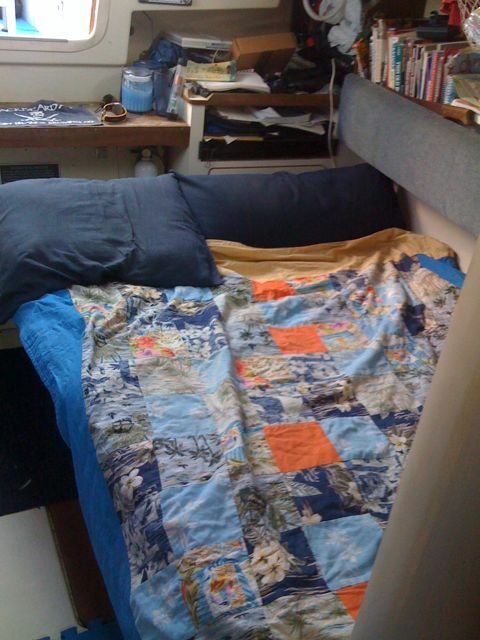 Want me to send down some fabric for your berth covers?